Where and when are your performances? We have two concert series: the Bancroft Family Concert series, and the annual Basically Beethoven Festival. The Bancroft concerts are staged at 3:00 on Saturdays in the Horchow Auditorium at the Dallas Museum of Art. The BFC season runs from October – May, with no concert in December. The Basically Beethoven Festival concerts are at 2:30 on Sundays in July at Moody Performance Hall (formerly Dallas City Performance Hall). Doors for both concert series open 30 minutes before the concert start-time. 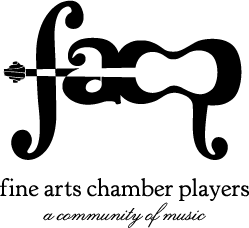 All of FACP’s concerts are free and open to the public – no tickets required. When you attend the Basically Beethoven Festival in July at Moody Performance Hall, you may be given a small ticket at the door. This is so we can get an accurate headcount. You simply give that ticket to the ushers at the auditorium doors. We hire professional musicians in the area. Though there is no cost to attend, FACP pays the artists a competitive rate to appear on our programs. Wait – how does that work? How do you pay the musicians without charging us ticket prices? Support from concert attendees, individual donors, government entities, corporations, and charitable foundations make it possible for FACP to offer free classical music programming to North Texans. Donations can be made online HERE. What should I wear to your concerts? We encourage you to wear whatever you’ll be most comfortable in, whether that’s your Sunday best or cargo shorts and a t-shirt. Darn it! Traffic was backed up. Is there late seating? As long as the auditoriums are not full, we will seat latecomers in between pieces in the program. There are rare exceptions to this, mostly tied to if the performers remain on stage between pieces. Yes, please! We aim to make classical music concerts accessible to ALL, and that includes families. If your child is restless, please exit the auditorium after a piece has concluded. If your child is audibly distressed, we thank you for discreetly exiting. You may not have to miss the performance! For the Bancroft Family Concerts at the DMA, there is often additional seating available in the nearby C3 Theater where the performance is simulcast. We welcome families to join us in the Horchow Auditorium, but the C3 Theater is a very child-friendly option UPDATE (2/25/2019): due to technical difficulties at the DMA, a simulcast in the C3 Theater will not be available for the remaining spring 2019 concerts. However, at Moody Performance Hall during the Basically Beethoven Festival performances, audio from the stage is played over the lobby speakers for guests. Can FACP provide music for an event I’m having? We do not have an ensemble-in-residence of musicians on staff or long-term contract, so typically we cannot staff events. Do you do anything besides these free concerts? Indeed, we do! FACP serves over 12,000 Dallas youth each year through our music education programs. Read more about our music education programs in Dallas schools HERE.